Playtime and summertime go together, and play is important in children's development and learning. It develops creativity and imagination, and allows children to make their own choices. Play-based learning takes children on adventures of their own choosing. 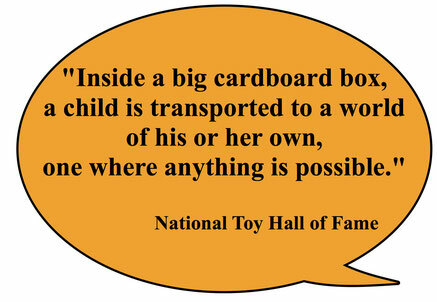 After reading the book, recycle a cardboard box into a plaything. You could even have a few other supplies on hand such as glitter glue, pipe cleaners, crayons, markers, string, toilet paper tubes, etc. 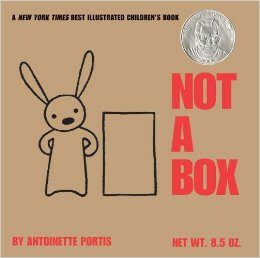 Not a Box is appropriate for preschool – first graders. With older children, you may want to enhance the book with a discussion about the nature of imagination at the website, Teaching Children Philosophy. Their “Not a Box” page contains excellent philosophical questions to correspond with the book. If you’re in the Rochester NY region this summer, visit The National Toy Hall of Fame, which is part of The Strong® a wonderful “interactive, collections-based educational institution devoted to the study and exploration of play.” In addition to the National Toy Hall of Fame, the Strong also includes The National Museum of Play, the International Center for the History of Electronic Games, the Brian Sutton-Smith Library and Archives of Play, and the American Journal of Play.